Want to remove System Live Protect (AKA LiveProtect)? How-to remove System Live Protect from your system. System Live Protect is a rougue spyware application. System Live Protect is often installed without consent through a trojan. System Live Protect displays exaggerated or false reports of system errors and infections, then prompts the user to purchase a registered version to remove the purported threats. DO NOT purchase System Live Protect, remove it! Select 2 and hit Enter to delete infect files. You will be prompted: Do you want to clean the registry ? answer Y (yes) and hit Enter in order to remove the Desktop background and clean registry keys associated with the infection. 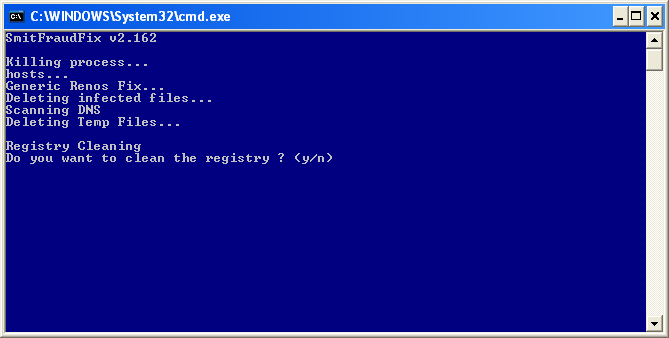 The tool will now check if wininet.dll is infected. 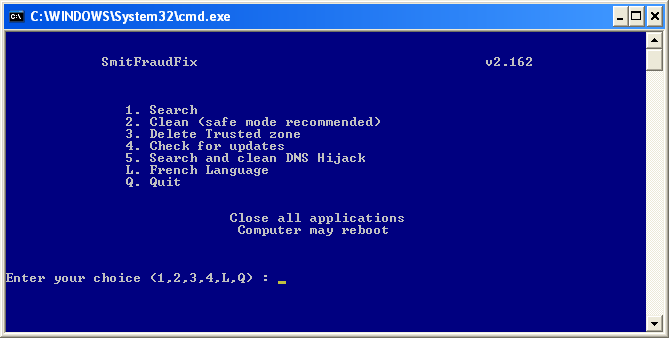 You may be prompted to replace the infected file (if found): Replace infected file ? answer Y (yes) and hit Enter to restore a clean file. To restore Trusted and Restricted site zone, select 3 and hit Enter. You will be prompted: Restore Trusted Zone ? answer Y (yes) and hit Enter to delete trusted zone. Has SmitFraudFix helped you? A tool like this takes a lot of time to keep updated. Please consider a donation to S!Ri so he can continue his hard work. Are you still having problems with System Live Protect, or other malware on your system? Please start a new topic in our Malware Removal Forum, after following these instructions. This topic has been left open to allow specific questions and comments related ONLY to this guide. It's NOT for posting HJT logs, links to your logs, or any other general malware help. Replies not following these rules will be deleted. Thanks for your cooperation. Is this System Live Protect automatically installed on all Vista OS's? Or how does it get there? Edited by MarkN, 27 July 2007 - 08:48 AM. Is this System Live Protect automatically installed on all Vista OS's? NO! System Live Protect is malicious software (malware), usually installed by a trojan. It's designed to look like a legitimate program, and only purpose is to entice you to buy it. Thanks, you had me worried there for awhile. It looks just like a Microsoft product. I was infected with this on my laptop running vista. Sadly smitfraudfix is not compatible with vista or so it tells me when I try to run the app in safe mode. any suggestions or advice on where to go from here? I'm not finding much through google. I used ctrl-alt-del to kill the system live process i saw, and was able to delete the folder...but i still get popups telling me my computer is infected and to download and install system live protect. Hello and Welcome to Geeks to Go! Hello! Thank you so much for the tutorial! I'm pretty sure it's the System Live Protect thing, do I have to do more to get rid of it? showed up again... Basically, how do I get rid of that X I guess? Edited by Princess Kairi, 23 August 2007 - 09:07 PM. Hello, I keep getting the "shield with an X on it" from System Live Protect. I have run the Smitfraudfix. The program does not appear to be on my computer, but it ask to install it. Please post a HJT log in the Malware Removal forum and someone will be with you shortly.